This show was broadcast on July 14, 2014. Matthew Alford: Did the CIA murder Hollywood scriptwriter Gary DeVore? British scholar Matthew Alford spent more than two years digging into the mysterious disappearance (a.k.a. apparent CIA assassination) of scriptwriter Gary DeVore, who had been investigating Bush Crime Family drug smuggling and other scandals relating to the US invasion of Panama. Now a brand-new documentary film recounts Alford’s investigation: The Writer With No Hands. Featuring some big film industry names including the legendary Haskell Wexler, it’s making the film festival circuit and getting good reviews. 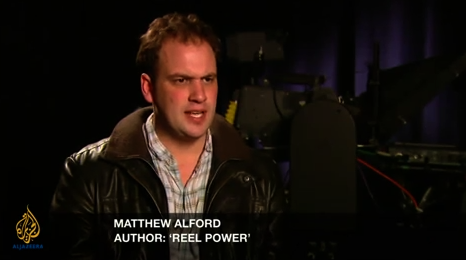 Matthew Alford is a lecturer in the department of Drama: Theatre, Film, and Television at the University of Bristol. He is the author of Reel Power: Hollywood Cinema and American Supremacy. Also check out his article on CIA manipulation of Hollywood, An offer they couldn’t refuse. This entry was posted on Thursday, July 10th, 2014 at 5:09 pm	and is filed under 9/11, Death Squads, Drugs, Freedom, Justice, Kevin Barrett, News, Protest, War Crimes. You can follow any responses to this entry through the RSS 2.0 feed.